KKL-JNF reports that over 3,000 acres of forest and another 4,000 acres of farmland have been destroyed since the onset of balloon attacks. 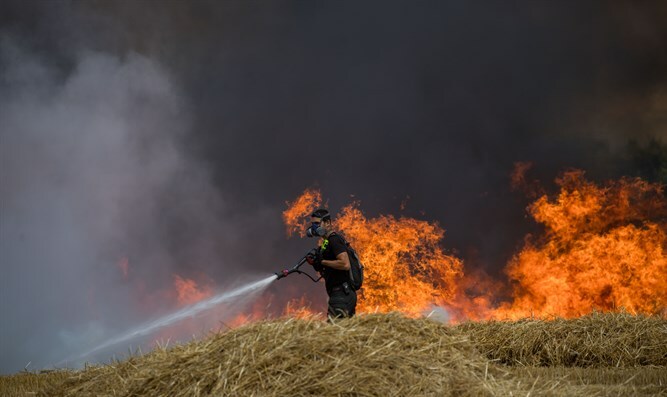 More than 3,000 acres of forest in the Northern and Western Negev desert have been damaged by arson attacks from Gaza. Marking six months since Gazan Arabs began sending incendiary balloons and kites over the border toward southern Israel, Keren Kayemeth L’Yisrael-Jewish National Fund reported Wednesday that some 3,279 acres, a total of 12,270 dunams, of forests have been damaged by fires caused by the attacks. Another 4,000 acres of farmland also have been destroyed by the fires. Keren Kayemeth L’Yisrael -Jewish National Fund firefighting teams have been on call 24/7, in order to quickly detect and respond to the ongoing fires, the group said in a statement. The largest amount of damage has occurred in the Be’eri and Kisufim forests in the Western Negev, and forests near the city of Sderot and Kibbutz Lahav in the northern Negev. KKL-JNF’s Board of Directors on Monday allocated 100 million shekels, or about $27.5 million, for special projects to help the Gaza border area communities. Meanwhile, copycats in Judea and Samaria have begun to send arson balloons toward Jerusalem and central Israel. An incendiary balloon was discovered on Wednesday in Jerusalem’s German Colony neighborhood. This comes on the heels of a similar arson balloon discovered in the courtyard of a home in the town of Givat Ze’ev, located just north of Jerusalem in the Binyamin region. Last week an incendiary balloon landed on a highway near the Modiin industrial zone in central Israel.